The enticing city of pearls and a ubiquitous welcome now has a hospice of luxury to back in the casa luxurio. A dweling of refined taste the Casa promises ultimate avenues of pure comfort to the elite and the discerning. 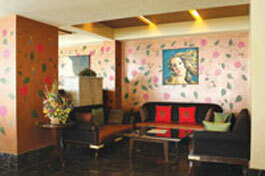 It houses 39 aesthetically done rooms, meeting and banquet facilities that exudes. Centralized Air-Conditioning, LCD & Satellite Transmission in each room, Wi-fi system, Foreign Currency exchange, Direct Direct Dial Telephone, 24 hrs High Speed Internet connectivity, mini Bar, Electronic Safes in all rooms, Banquet and Convention facilities, Laundry and Valet service, Doctor on call, Travel Desk. Any event big or small is speciall Apart from offering conventional luxuries, we give the event a character. We work with individuals and corporate clients to help plan and arrange their special day and make it a respinding success. The executive, imperial rooms at the Casa are designed to pamper you with an array of exquisite fumishing and tasteful living. Every room opens to a balcony that offers a scenic view of the surrounding greenery. The suites have a paramount air about them, that makes you feel like a monarch. Exdusive play areas, facilities, extra beds and mattresses are provided to make the place a befitting stay even for the little princes and princesses. The Palate is a muiticuisine restaurant at the Casa luxurio, equipped to serve the best of Indian, Thai, Chinese, Mediterranean and Continental food. The delectable spread is bound to bowl you over and satisfy every appetite for great dining and entertainment. Sinik your teeth into the mouthwatering dishes at its various restautants and linger with your choice of liquor at the 'Serenade' bar. 'Metrolitz' is a roof top Banquet hall that offers a beautiful view and has 350 seating capacity. Be it weddings, birthday parties, anniuversaries, conferences or even a simple get-together, Casa Luxurio offers premium facilities that are custom-made or modified for every occasion. Coming to weddings, couples seeking a genuinely unique setting for that special occasion would be delighted at the Casa Luxurio. Good spread of Indian and Chinese Cuisine, Snacks Veg. and Non-Veg.